With temperatures well below freezing Tuesday morning rain mixed with sleet and some wet snow will move into southern and western portions of the Chicago area mid-morning Tuesday, spreading over most of northeast Illinois by afternoon. Travel conditions are likely to become very hazardous - roads, highways, streets sidewalks and parking lots will become ice-covered and very slick with the afternoon/evening commute directly affected. Temperatures are expected to rise through the 20s, finally reaching the lower to middle 30s later in the day - warm enough to begin to melt the ice. 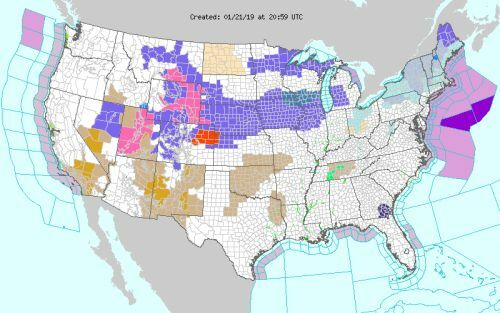 Travel west will be also affected by this storm system moving out of the central plains - Winter Weather Advisories in effect from Chicago west through Iowa and Nebraska in to Colorado and Wyoming .